What's the first thing you think of when thinking of canary foods? I know what you're thinking...Bird seed of course. And you'd be right. However, it's important to know that there are as many kinds of commercially available seed mixtures as there are species of bird. Give your canary...Canary Seed--Hey, I never said this is rocket science. There are different mixtures of canary seed. Make sure you're using a good one for your canary foods. Hint...you get what you pay for. For great tips on seed as canary food read this article...CLICK HERE. A great variation on the standard DRY canary mix is soft seed. Prepared correctly it is a highly delectable addition to plain old dry seed. See the article The Controversy: Boiled Seed vs. Soak Seed. Remember, some treats are great as bird foods and others can KILL...and I'm not just talking about brownies and other fattening foods. (Actually brownies won't kill your canary but they will make him fat and unhealthy. )And a canary that's not feeling well is often not noticed. They tend to hide their illnesses. One of the things I strongly encourage you to do is learn how to spot any sign of an illness. You can learn more about spotting vague symptoms at www.CanaryBirdListening.com. What I am talking about are foods you might not ever think of like avocados, apple seeds, and several others. Click here to learn what foods are super-bad for your canary---IMPORTANT. "So...what are the GOOD treats?” you ask inquisitively. Glad you asked...A steady supply of GOOD treats will provide your canary with vitamins, minerals, and fiber. Not to mention-->Variety. Your canary can die within 24 hours without water. The standard glass tube waterer works great. There is one exception to this rule...When bringing a new canary home for the first time, it’s probably a good idea to have an easily accessible water dish in the cage in addition to the tube waterer. When you move a canary to a new cage he might be somewhat disoriented for a day or so and not be able to find the waterer. Make it easy for him that first day or two. You might see him using the temporary dish as a bath tub. Don't worry too much about it. Let him have fun. Canaries love to take baths. Just remember to change the water often. You should provide him with a shallow dish or bird bath a couple of times a week anyway strictly for that purpose. Get a bath ready for your canary early in the day and remove it by late afternoon. You want to make sure the bird is dry before night sets in, plus you don't want him drinking the "foul" bath water. OK where do you NOT want to place your pet canary's drinking water?...That’s right...No canary foods or water under a perch. Near a perch is good. Under a perch is bad. Don't make me slap your hand! You should change the drinking water and clean the waterer every day to keep them bacteria free. I’ve known people to change their water once per week without any problems but bacteria growth in the waterer can make your bird sick. And how good can week old water taste anyway? Bird owners have been giving there flying friends grit as a supplement to canary foods for ages. Lately though there has been a bit of a disagreement among canary aficionados as to the best grit policy...Click here to find out if you should give your canary grit or not. My personal opinion is that canaries NEED grit and grit supplemented with minerals is ever better. canary vitamins coursing through his body for optimal canary health. Without living in his native habitat it's difficult to get everything he needs...even though you may be giving him all the BEST canary foods. "How much? When? What kind? Where do I get the canary vitamins?" Whoa!...Hold on just a cotton pickin' minute...one question at a time. There are plenty of answers to your questions and plenty of time to get to them...Click here for answers to your canary vitamin questions. O.K. That's my summary on canary foods. Click over to one of the articles mentioned above for more details. How Do YOU Feed and Water YOUR Canary? 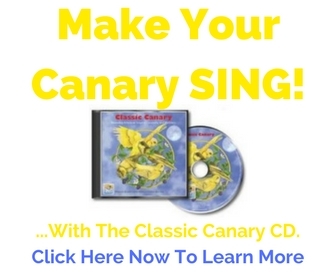 Do you have an idea, tip, or story that may help other canary owners with feeding and watering? Share it! Enter A Title For Your Tip Here. For example, "Here's How I Use The Seed Dish"
I bought a desktop fountain for my canary's cage so he always has fresh running water for drinking, bathing and he loves to play in the fountain. I have always fed my canary chickweed. They love it. Make sure it's washed before feeding them.